At Aquarius Blinds we’ve been designing and fitting commercial awnings in London and across the UK for over 30 years. 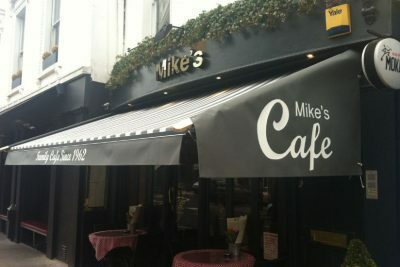 We make bespoke awnings for shops, restaurants, bars, pubs, hotels, schools and nurseries, offices and more. Any commercial business looking to maximise their use of outside space, add shading, or simply looking to enhance their brand name, will benefit from one of our many awning solutions. We understand every business is different. It’s why we choose to offer a bespoke awning solution so you get exactly the commercial awning solution you need to enhance your business. Our professional team will deal with everything from measuring through to manufacture and installation. 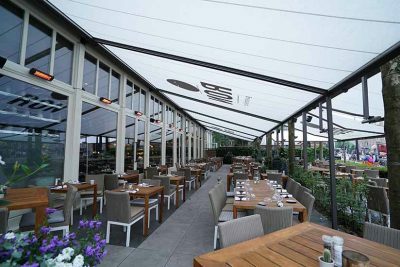 We’ll guide you and offer expert advice right from choosing the style of awning best for your business down to fabric choice and operation. 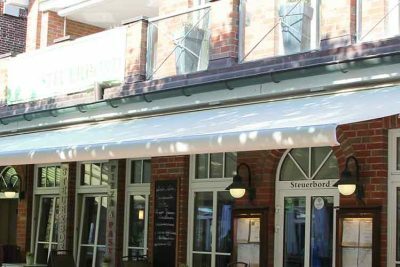 We offer an extensive range of awnings suitable for a wide range of businesses and retail outlets, which have been designed to withstand the demands of a commercial setting. We can source awnings from our continental partners or we manufacture them ourselves at our in-house UK manufacturing plant. 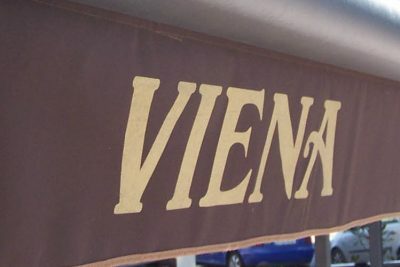 We make products such as Traditional awnings and Dutch style canopies. We control quality, delivery and price, giving our customers a no-fuss, on-time and on-budget service. At Aquarius blinds we make purchasing an awning easy. We think it’s incredibly important that we only employ our own installers. Why? 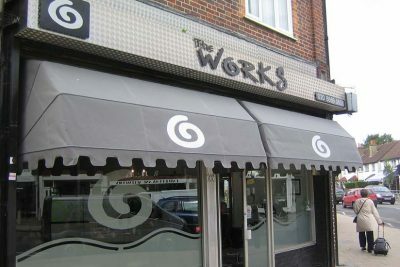 Because we want to be absolutely sure the installation is of the same high standard as the awnings we make and supply. We just wouldn’t be happy employing subcontractors. We want to be sure our fitters have the appropriate training, so that’s exactly what we do. We understand that sometimes it takes more than an awning to make your outside space pop. 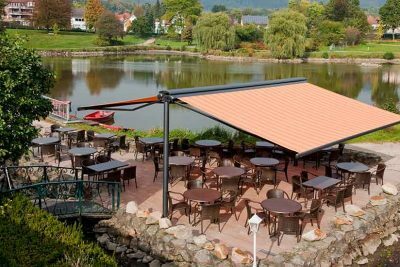 To ensure your awning is put to maximum use and it gives your business maximum benefit, we offer a range of accessories, such as heating, lighting, and café barriers. 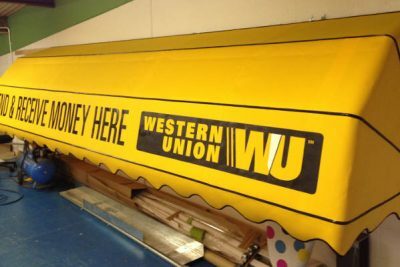 We also offer a comprehensive sign writing service. It means you can get everything you want from your awning from a single supplier. It brings your whole awnings package under our own control, which means everything gets done on time and with the minimum of fuss. 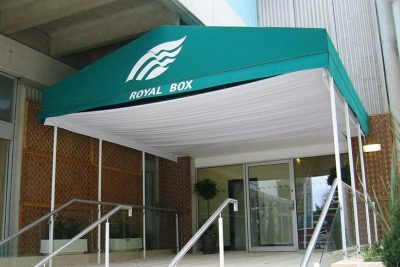 For a complete advisory, measuring, manufacturing and installation service for all types of commercial awning, look no further. 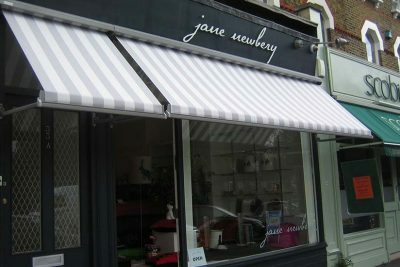 As a family-run business, we have an exceptional reputation and we’re one of the leading specialists for awnings in London and the south for all types of commercial application. We are passionate about shading solutions; we always use high-quality materials and we’re just as passionate about customer service too. 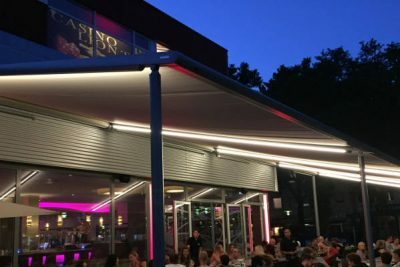 If you want to enhance your business capacity and make your business stand out from the crowd, an Aquarius Blinds’ awning is just what your business needs. We’ll bring you a shading solution of superb quality, in an agreed lead time and fitted by our own expert installers. Our showroom and manufacturing plant is based on the outskirts of south London. Our showroom gives you the opportunity to see the quality of our products from fabric choices through to the advanced technology used for our different operational electric motors. Come and meet our expert Awnings London team who can offer the guidance you need to choose the best solution for your business. See our contact page for opening times and directions. We look forward to seeing you soon.